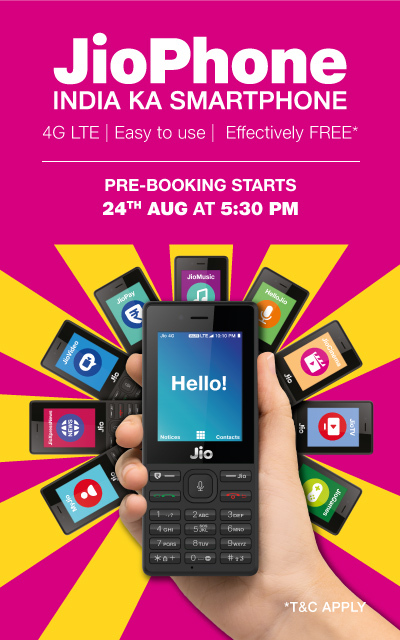 Jio announced their new smart phone booking starts on 24/08/2017 at 5.30 p.m. You can book this amazing phone either in online or direct from near Jio store. You can order this phone from my Jio app. You can book the phone by paying Rs 500 on the first-come-first-serve basis. The remaining Rs 1,000 can be paid at the time of delivery. Customers can get a full-refund of the security deposit of Rs 1,500 by returning the used JioPhone after 36 months. Payment can be made through debit,credit cards and internet banking.